Taratala Road, Kolkata, India- 700088. I've been providing tuitions to strong as well as weak students for 3 years. I have the experience of teaching little ones reaching the grass root level of their understanding. I provide special attention to the science subjects and at the same time take care of the student's grasp on the other subjects..
"He is a good teacher. He mainly focuses on the basics and fundamentals and makes studies more easier. I am lucky to have a teacher like you sir. " "He is a very good teacher and makes sure to easily make us understand all the different concepts. He makes studying fun "
"Swarnendu sir is quite good is teaching young minds. He is awesome in communicating with the understanding of his students. I was quite benefited because of him. " "Swarnendu Sir is quite good at almost subjects, especially the science subjects. I was quite benefited by him. I would recommend him. " What would be the fees for Physics, Chemistry and Maths for 12 Std per month in my home? My location is THIRUPADIRIPULIYUR in Cuddalore. Swarnendu Chatterjee conducts classes in Class 6 Tuition, Class 7 Tuition and Class 8 Tuition. Swarnendu is located in Taratala Road, Kolkata. Swarnendu takes at students Home and Regular Classes- at his Home. He has 3 years of teaching experience . 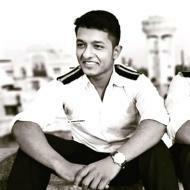 Swarnendu is pursuing Bachelor of Technology (B. Tech.) from INDIAN MARITIME UNIVERSITY. He is well versed in Bengali, Hindi and English. Swarnendu has got 12 reviews till now with 100% positive feedback.